He's spent most of his life being tortured in a tiny cage at a bear bile farm. So it's no wonder then that Tuffy the bear couldn't help but jump for joy after he was finally freed. 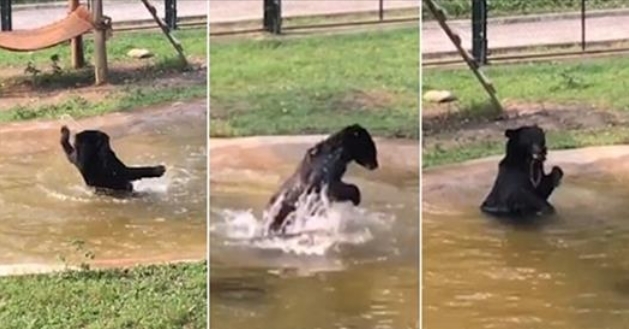 A heartwarming video shows the huge bear splashing around in a pool in his new home. Tuffy now lives at Animals Asia's Vietnam sanctuary after his rescue. Bear bile farms extract bile from the animals, causing huge damage to their gall bladders. The bile is then sold to become an ingredient in traditional Chinese medicines. Tuffy's was so damaged that it ended up being removed. The black bear also had three fractured teeth and dry, cracked paws when he arrived at the sanctuary. But, as the video shows, Tuffy is now enjoying his new life - so much that he wildly splashes and jumps around his pool. Animals Asia Bear Manager Louise Ellis said: 'Coming from years of little or no water, for Tuffy this must feel like a true oasis after being parched and in pain for so long. 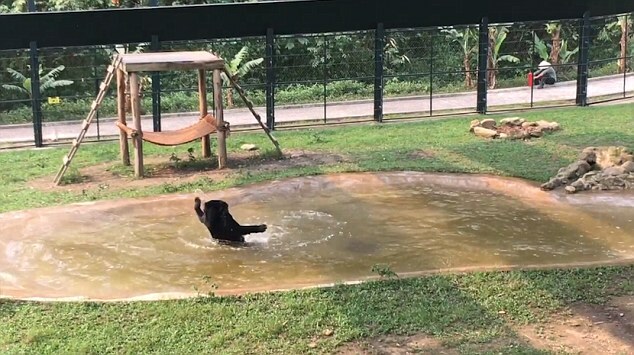 Responses to "After Spending Life In A Cage, Bear Is So Happy To Just Splash Around "
That is so wonderful to see him playing. Thank you for rescuing him. I hope he has a long & happy life.